We live in a radioactive world – and always have. Radiation is part of our natural environment. We are exposed to radiation from materials in the earth itself, from naturally occurring radon in the air, from outer space, from the sun, and from inside our own bodies as a result of the food and water we consume. Radiation is measured in units called rems. A rem is a large unit, much like a mile is a large unit of length, so we usually refer to a millirem (mrem) instead, much as you would measure in inches instead of miles for most purposes. (It takes 1000 mrem to equal one rem.) Other terms seen as basically equivalent to a rem is a rad or a Roentgen. Some newer measurements are in milli-sieverts. Equivilents in this measure are, 100 mrem = 1 mSievert, or 1 mrem = 0.01 mSievert (mSv). The National Council on Radiation Protection (NCRP) says that the average resident of the U.S. receives about 360 mrem every year from background sources. Other reports have estimated some of us may get up to 1000 mrem and some studies have shown increased cancer risks at this level. Background radiation sources include comes from outer space, radioactive materials in the earth, and small amounts of radioactive material in most foods we consume. We get about 2 mrem per year from sleeping next to someone! This is because all of us have very small amounts of naturally occurring radioactive materials in our bodies. Even some granite countertops, an igneous rock formed by the intense heat and pressure of the volcanoes, over a period of time transformed to a metamorphic rock have now been shown to emit both radon (a radioactive gas) and small amounts of radiation. Radon gas is produced by decaying uranium in soil and rocks. Enough of this gas gets trapped in your house to deliver about 200 millirems per year. Some of this exposure can be higher than even acceptable limits and there are test kits for radon and professionals who can measure the gas as well as the countertops. Former US Surgeon General C Everett Koop stated that tobacco radiation is probably responsible for 90% of tobacco-related cancer. Dr RT Ravenholt, former director of World Health Surveys at the Centers for Disease Control, has stated that “Americans are exposed to far more radiation from tobacco smoke than from any other source.” Therefore, second-hand smoke can be just as harmful to nearby non-smokers, especially children. Naturally-occurring radioactive minerals accumulate on the sticky surfaces of tobacco leaves as the plant grows, and these minerals remain on the leaves throughout the manufacturing process. Additionally, the use of the phosphate fertilizer Apatite – which contains radium, lead-210, and polonium-210 – also increases the amount of radiation in tobacco plants. The radium that accumulates on the tobacco leaves predominantly emits alpha and gamma radiation. The lead-210 and polonium-210 particles lodge in the smoker’s lungs, where they accumulate for decades (lead-210 has a half-life of 22.3 years). The tar from tobacco builds up on the bronchioles and traps even more of these particles. Over time, these particles can damage the lungs and lead to lung cancer. Conservative estimates put the level of radiation absorbed by a pack-and-a-half a day smoker at the equivalent of 300 chest X-rays every year. 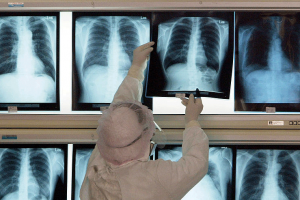 The Office of Radiation, Chemical & Biological Safety at Michigan State University reports that the radiation level for the same smoker was as high as 800 chest X-rays per year. Another report argues that a typical nicotine user might be getting the equivalent of almost 22,000 chest X-rays per year. According to research, cooking food in a microwave may alter the physical make up of the food. It is known that the irradiation process breaks up the molecular structure of food and creates a whole new set of chemicals, known as unique radiolytic products (URPs). These URPs include benzene, formaldehyde and a host of known mutagens and carcinogens. This fact alone has obviously caused considerable controversy over the potential hazards of eating irradiated foods of any kind. Food irradiation is a process whereby the food is exposed to high levels of radiation in order to kill insects, bacteria and mold, and make the food last longer on the store shelves. Although the idea of radiating food sounds quite unappetizing to most people, it has been practiced in the USA since the 1960’s, when the Food & Drug Administration approved the irradiation of wheat and white potatoes. During the 1980s, the FDA approved petitions for irradiation of spices, herbs and seasonings, pork, fresh fruits and vegetables, and dry or dehydrated substances like enzymes. Poultry received approval in 1990. The FDA approved irradiation for unfrozen red meat in 1992, frozen red meat in 1999 and eggs in 2000. The gamma energy penetrates the food and its packaging, but most of the energy simply passes through the food, similar to the way microwaves pass through food, leaving no residue. The small amount of energy that does not pass through the food is negligible and is retained as heat. The minimum dose used in food irradiation for food preservation or destruction of parasites or pathogens is 30,000 rad. In the United States, food growers and manufacturers must mention on the label that the food is irradiated, so avoidance of irradiated foods is possible if one shops carefully. (The package symbol for irradiated food is a green flower-like graphic). However, if you eat out at a restaurant you will not know whether you are eating irradiated food, as they are not obliged to reveal that information. It is clear that food irradiation has not been adequately tested on humans, and the negative implications are apparent. The average lifetime dose of diagnostic radiation has increased sevenfold since 1980, mostly through the use of X-rays. X-rays are energy in the form of waves, identical to visible light, the difference being that light doesn’t have enough energy to go through your body and x-rays do. Some advances in equipment have improved to give us less radiation than previously required, like dental Xrays. A typical dental x-ray image exposes you to only about 2 or 3 mrem. However, diagnostic scans are being used much more frequently than before, especially in emergency rooms, sometimes being ordered before the doctor has even examined the patient. For women, the most frequent source of radiation exposure is the annual mammogram, dosing at an average of 70 mrems. This is about the dose you’d receive from your everyday environment over a period of two and a half months. Yearly mammograms have been recommended for women age 40 and up. Now a new controversy has arisen since November 2009 when the U.S. Preventive Services Task Force recommended that women without risk factors for breast cancer wait until their 50s before going in for regular mammograms, and then only every other year until age 74. Although studies have shown no increased risk of cancer among people experiencing as many as 1,000 millirems per year of background radiation, these dosage figures are for environmental radiation on the whole body. When we have diagnostic tests or radiation treatments, radiation is delivered to specific body parts and can have a greater effect. Tissues that grow new cells more rapidly, like bone marrow or the thyroid gland, are more vulnerable. In the breast, the rate of cell growth varies with the amount of estrogen. Younger women who have more estrogen are more susceptible and post-menopausal women are less so. Weighing the benefits and risks of diagnostic tests has always been an issue. Mammograms do reduce the risk of dying from breast cancer by about 15% for women in their 40s and 50s, the task force says. But their absolute benefit for younger women, whose risk of cancer is very low, is much smaller. In addition, after 10 mammograms, more than half of women in their 40s will have a “false positive,” which occurs when a mammogram detects something suspicious that turns out to be benign. Suspicious findings cause anxiety and may lead women to undergo painful needle biopsies. A Lawrence Berkeley National Lab study has demonstrated that breast tissue is extremely susceptible to radiation-induced cancer, confirming warnings by numerous experts that mammograms can initiate the very cancers they may later identify. The table below shows the dose a patient could receive if undergoing an entire procedure. For example, a lumbar spine series usually consists of five x-ray exams. CT stands for computed tomography and is sometimes called a CAT scan. New research shows that even very low doses of X-ray can delay or prevent cellular repair of damaged DNA, raising questions about the safety of routine medical X-rays. Radiation damage is cumulative and each successive dose builds upon the cellular mutation caused by the last. It can take years for radiation damage to manifest. Each year that today’s scanners are used, 14,500 deaths could result, researchers say. When healthy people are exposed to the radiation, the imaging may create more problems than it solves. Widespread overuse of CT scans and variations in radiation doses caused by different machines — operated by technicians following an array of procedures — are subjecting patients to high radiation doses that will ultimately lead to tens of thousands of new cancer cases and deaths, researchers reported recently. Several recent studies have suggested that patients have been unnecessarily exposed to radiation from CTs or have received excessive amounts, and two studies published Jan, 2010 in the Archives of Internal Medicine were the first to quantify the extent of exposure and the related risks. In one study, researchers from UC San Francisco found that the same imaging procedure performed at different institutions – or even on different machines at the same hospital — can yield a 13-fold difference in radiation dose, potentially exposing some patients to inordinately high risk. While a normal CT scan of the chest is the equivalent of about 100 chest X-rays, the team found that some scanners were giving the equivalent of 440 conventional X-rays. The absolute risk may be small for any single patient, but the sheer number of CT scans — more than 70 million per year, 23 times the number in 1980 — will produce a sharp increase in cancers and deaths, experts said. Dr. Rita F. Redberg of UC San Francisco, editor of JAMA Internal Medicine, wrote in an article in 2014 for Medscape Cardiology, documenting and discussing the excesses and dangers of radiation. Even many otherwise healthy patients are being subjected to the radiation, she said, because emergency rooms are often sending patients to the CT scanner before they see a doctor. Whole body scans of healthy patients looking for hidden tumors or other illnesses are also becoming more common, even though they rarely find anything wrong. In many states, you don’t even need a health practitioner to order it, one can do on one’s own. The irony is that, by exposing healthy people to radiation, the scans may be creating more problems than they solve. CT scans, short for computed tomography, provide exceptionally clear views of internal organs by combining data from multiple X-ray images. But the price for that clarity is increased exposure to X-rays, which cause mutations in DNA that can lead to cancer. When the screening is used for diagnostic purposes, the benefits outweigh the risks, most experts agree, though the toll increasingly can’t be ignored. Scanner manufacturers are designing instruments that use lower doses of radiation, but many older machines rely on higher doses. Machine settings for particular procedures are not standardized, and individual radiologists use the technology differently for different patients, leading to wide variance in doses delivered to the subjects. The episodes of unusually high radiation doses delivered to patients at Cedars-Sinai Medical Center in Los Angeles and Glendale Adventist Medical Center were particularly egregious examples that involved inadvertently inappropriate settings on the instruments, and such cases were not included in the new analyses. The highest doses of radiation are routinely used for coronary angiography, in which cardiologists image the heart and its major blood vessels to look for blockages or other abnormalities. Under the normal dosages of radiation for the procedure, about 1 in 270 women and 1 in 600 men who receive it at age 40 will develop cancer as a result, reported Dr. Rebecca Smith-Bindman, a professor of radiology and epidemiology at UC San Francisco, and her colleagues. Surprisingly, according to Dr. Michael S. Lauer of the National Heart, Lung and Blood Institute, there are no clinical trials that show such imaging saves lives. For a routine head scan, one in 8,100 women who undergo the scans and one in 11,080 men will develop a tumor. “For 20-year-old patients, the risks were approximately doubled, and for 60-year-old patients, they were approximately 50% lower,” the researchers wrote. In a separate paper, epidemiologist Amy Berrington de Gonzales and her colleagues at the National Cancer Institute constructed a computer program to estimate the risks associated with CT scans. They concluded that about 29,000 future cancers could be related to CT scans performed in the United States in 2007 alone. That includes 14,000 cases resulting from scans of the abdomen and pelvis, 4,100 from chest scans and 2,700 from heart scans. Taking into account the cancer mortality rate from radiation exposure, plus the age of the population undergoing such scans, the researchers estimated that the cases would result in 14,500 deaths per year. Two-thirds of the cancers would be in women, who are more vulnerable to radiation. And the younger a patient is at the time of the scan, the higher the risk of cancer eventually developing. Researchers’ conclusions are based on the assumption that the patients receive a normal dose of radiation, but that is not necessarily a good assumption. Smith-Bindman and her colleagues studied the radiation doses received by 1,119 adult patients at four San Francisco Bay Area hospitals between Jan. 1 and May 30 of 2008. Estimating the amount of radiation received by the patients, they concluded that dosing was highly variable both between institutions and within them as well. Some patients got below-normal doses. There is little that individual patients can do about the vagaries of doses delivered by different machines. But they do need to be their own advocates, said Dr. Rosaleen Parsons, chair of the department of diagnostic imaging at Fox Chase Cancer Center in Philadelphia. Patients should keep their own records of the number of scans they have received, question why repeat studies are necessary and argue for other types of imaging, such as magnetic resonance imaging, or MRI, to minimize exposure to radiation, she said. More than half of all cancer patients receive radiation therapy. Without a doubt, radiation saves countless lives, and serious accidents are rare. However, a recent expose by the New York Times has found cases of severe errors and a system-wide lack of control and oversight. The Times found that while this new technology allows doctors to more accurately attack tumors and reduce certain mistakes, its complexity has created new avenues for error — through software flaws, faulty programming, poor safety procedures or inadequate staffing and training. When those errors occur, the effects can be crippling to deadly. Regulators and researchers can only guess how often radiotherapy accidents occur. With no single agency overseeing medical radiation, there is no central clearinghouse of cases. Accidents are chronically under reported, records show, and some states do not require that they be reported at all. Recently mandated as part of the “enhanced” screening for travelers from selected countries, body scanners are in use at many U.S. airports. The number is expected to skyrocket. The Transportation Security Administration said it will order 300 more machines. In the summer of 2009, TSA purchased 150 machines with $25 million in American Recovery and Reinvestment Act funds. These machines are already being field tested at several U.S. airports, including JFK, LAX and Orlando. There have been reports of “no scan, no fly” policies at some airports although the TSA said one could ask for a pat-down instead of going through the scanner. Currently the TSA is using two types of screening machines. The millimeter wave imaging machine uses radio frequency energy to image the body. According to the TSA these deliver 10,000 times less energy than your cell phone. The other type of machine is a backscatter X-ray. A backscatter x-ray machine can render a three- dimensional image of people by scanning them for as long as 8 seconds and produce a ghostly naked image. These X-rays are very low level, as they bounce radiation off the skin and back to the machine allowing authorities to scan for dangerous items under someone’s clothes. it bounces off the skin, not penetrating it or your organs (and probably won’t be able to tell if a terrorist is hiding anything within a body cavity). This is unlike a medical X-ray which is a higher level of radiation penetrating the skin to see bones and other tissue. The American Cancer Society stated its experts do not anticipate this being a serious issue for infrequent travelers. The Committee cited the IAEA’s 1996 Basic Safety Standards agreement, drafted over three decades, that protects people from radiation. Frequent exposure to low doses of radiation can lead to cancer and birth defects, according to the U.S. Environmental Protection Agency. Medical professionals working with Xray and radiation equipment are required to wear a badge that measures radiation. The standard maximum whole-body dose of radiation is 5,000 millirem per year. To put these scans in perspective, it would take you 125 thousand trips through these scanners to max out. Reduce your exposure to electromagnetic radiation by increasing your distance. Take action and make your concerns known. TSA’s consumer e-mail address is: TSAContactCenter@dhs.gov. TSA toll free comment line is: 1-866-289-9673.